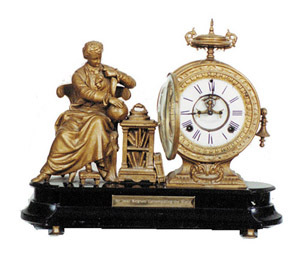 Ansonia Clock Co. figure clock, "Newton", ca 1894. It is 8 day, striking a gong hours and half hours, 2 piece porcelain dial with open escapement. Hairlines and chips abound. I would order a replacement dial ring from Timesavers. Base, statues, clock tower, have been refinished some time in the past. Black enameled base is 17 1/2 inches wide and total clock height is 15 inches. A bronze plaque on the front of the base says, "Sir Isasc Newton: Contemplating the World". A very attractive case and statue combination. Original and complete except where noted. Glass is bowed which is different, and beveled. Ly-Ansonia No.512.